How is this gpu a fail when it offers almost Vega64 performance at half the price? This doesnt sound good right? Use of the word fanboys is considered inflammatory. You seem to have missed the 1440p part of the discussion. I didn't, I just think 1440p would be a better fit as well as 4k. And shortly after Vega launched, the mining craze completely warped our memories! Vega was definitely a smart buy on release. You got wrong the Revenue graph (Fiscal Year) with the Shipments graph. Where did you see that NVIDIAs low end collapsed ??? My bad, anyway general numbers are still the same - cost/card going up substantially. If the cost/card is going up then that is a strong indication of less low end sales and more high end sales. This combines with what was happening at the time - cpu integrated graphics improving and removing the need for low end discrete cards. This is not correct , just check Steam numbers to realize that GTX1050/ti + GTX 1060 3GB/6GB occupy 30% of the entire gpu users. What you want to see is the Margins not the ASP and margins have increased significantly the last 4-5 years. This indicate that the increase of selling price was significantly higher than the increased cost of manufacturing (cost of revenue) due to higher wafer prices. GTX780 can now be demoted to an easy life in the family HTPC\Gaming rig. If the price is reasonable, it is solely because of stagnation over the past two and a half years. In any previous generation, their XX60 card would have the same relative performance for $200-250. 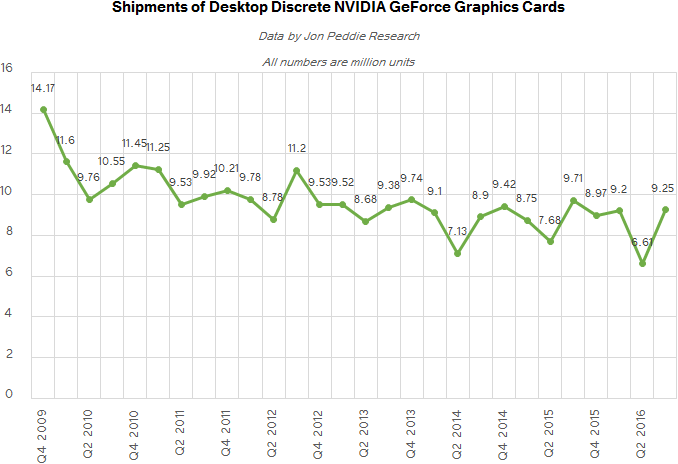 This myth about higher production cost impacting negatively NVIDIA is easily debunked by those graphs above. 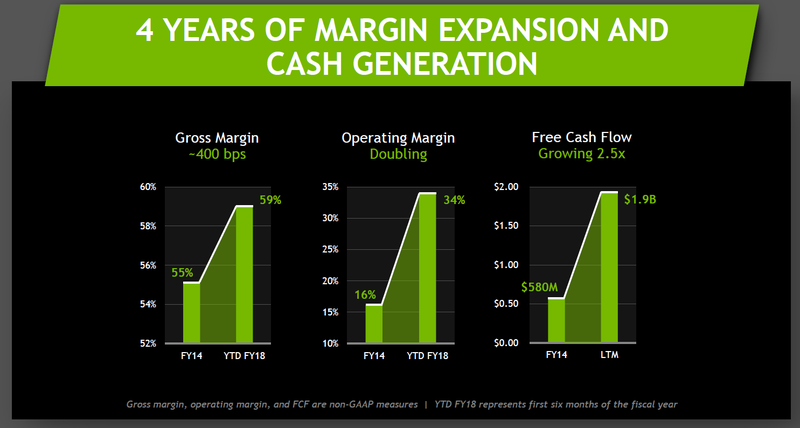 NVIDIAs margins are growing instead of at least being at the same level. And since total graphics cards volume sold each year is not growing, the only thing making those margins going up is the increase of income. NVIDIA can be profitable even if it will sell RTX1080Ti at half the price ($699), they will just make less income. Should they ??? no, they are a business and they want to make money, but that doesnt mean we should pay whatever NVIDIA want to price its products. That is what every sane consumer is having a problem with current GPU prices and why we are raising our voices in forums like AT. What we have is explosive growth and volume of the high end market due to mining, which over inflated the value of cards and kept pricing and demand high. High end cards have the highest margins and it overlapped the mining market. What happened is graphic cards became undervalued overall but overvalued in gaming market. For miners and potential investor, the prospect of being able to make money back in two or 3 months while keeping largely the value of the purchased good(they didn't assume the crash would come so hard), while anytime after that would be profit became too interesting and appetizing attracting even the attention of the general public. What this created is a huge new demand which constrained the supply keeping price up. Gamers don't like seeing the price to performance of cards to remain static for two years. But to miners and also to miners/gamers, the thought of being able to pay for there investment in two to three months and afterwards, turning anything else afterwards into pure profit meant all of a sudden videocards were all of a sudden undervalued. This type of profit is unheard of any business for a piece of equipment which if all goes well, appreciates over time. This turned videocards literally into money making machines. Along with small time miners, this attracted venture capital money, illegal blackmarket money(drug/illicit) to be invested into videocards which blew up the market. What this allowed because cost stayed high is for both Nvidia and AMD to absorb any additional income due to better yields over time as profit while additionally the ramp up of high end discrete cards translated into pure profits which made the gaming market vastly more profitable than it was before. As a result, we didn't see the normal discrete market drops of earlier years, we saw increases in pricing and sales. And more importantly they all happened at the mainstream to high end where margins are the best. Combine all these factors and you have the potential for explosive revenue growth. On top of this, for the benefit of Nvidia and AMD, games like Fortnite and PUBG just happened to coincide with this mining market which created new demand in the gaming market ensuring the videocard supply market would remain constrained for gamers would remain constrained as well. This is what lead to the graphs you posted along with crazy growth of the AI/Pro market. Professional products have really high margins and particularly the data center market, had extreme growth over the years. I noticed your graphs(perhaps strategically on your own part) are missing for the most recent periods where this is clearest. What we will see next quarter is a big market correction which shows the true size and worth of the gaming market. Margin will stay high but this is the result of the professional market and how much revenue they represent for the company. But we will see a huge drop in net profit and net profit margin back to more regular level when the correction occurs. The temporary increase in sales due to the mining market cannot be seen as typical. The EVGA is doing a good job keeping things cool and quiet with just the single fan. In a 19c room it idles at about 24c. Most games it peaks at about 59c and the highest I've had so far was 69c @1980ghz after playing BF5 on max settings for an hour. Had everything set to ultra with DXR set to low and FX textures rolled back. No issues with it set to low and seemed to run pretty smooth. Just upped it to medium today and had the occasional stutter. Had some background processes running so will probably try again later. Messing around in single player right now so still need test settings a bit. When I get some time I'll play around with DXR some more. Might even try some online play. Not bad on my aging 2700K at stock speeds. If you were lucky to snag one at that price. Vega's black eye came from the bundles, coupons, misinformation, and finger pointing before miners got to them. Browsing reddit, I remember very few being able to get the original price. Great post. The mining boom really pissed me off exactly for what your post explains. Suddenly early adopters, who've always been there, get chastised for "supporting greedvidia" because MINERS over inflated the cost of cards. Rewind a few years back and posters like the one you quoted would then post something like "AMD is selling all their cards like hot cakes" but that was good THEN, now as we're seeing the aftermath of all these cards jumping 1.5-2X their historical values, "oh won't someone please think of the consumers." It was "consumers" that got us in this hole in the first place, and I don't mean the usual "consumers" of these products. We, as a community, became a fad, and like most fads, they often don't care of the long term effect. But at least some people got paid, least I'd assume based on their "I have 100 cards farming in my empty bedroom" posts. None of these companies are our friends. Buy what fits your needs. You want to cheer lead one, fine, but don't pretend your preferred company won't rake you over the coals when they get their chance. Because, both sides are clearly showing they want the most bang for our bucks. I agree with you there. No company is our friends and both companies are out to make as much money as possible. Miners really distorted the market because they artificially increased demand. 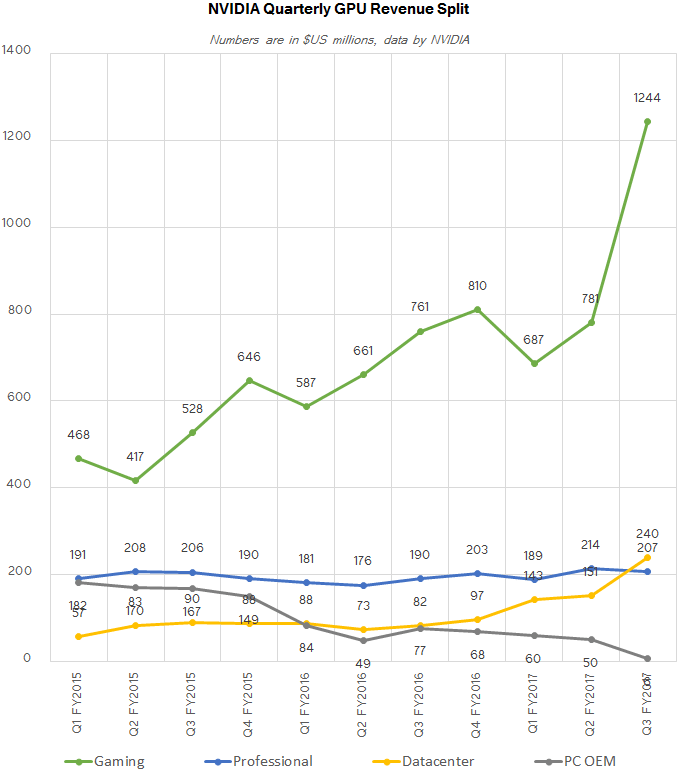 People complained that Nvidia and AMD were purposely undersupplying the market to keep pricing up, but from the revenue shortfalls from both companies with the death of mining, AMD and specifically Nvidia ramped up production heavily which is why their revenue grew so much. The problem is even with that increased production, miners just swallowed it up. The irony was the miners on this forum were blaming everyone but themselves for the high price of videocards at the time but as we can see from the fallout, the miners were the culprit for prices. Any price drops on cards at the time would have simply been swallowed up by miners because of their use of bots to allocate and obtain cards. One more thing that suspicious is the timing of these HBM2 prices and leaks. Did you notice after the whole rebate(temporary rebates to make the $499) and bundle scheme, all these articles about HBM2 and AMD was taking a loss on these cards and all of a sudden people were okay with 599 Vega pricing. That seems like a repeat of today. When Vega VII was launched with pricing of 699, people were not happy with the price. Now of a sudden, typically heavily guarded secrets of videocards BOM come about Vega Vii and now people are okay with Vega costing 699. These rumors are very convenient for AMD. But the later particularly smells for me. The thing is HBM2 has to have fallen at this point compared to the release of Vega 56/64. Not only has the price fallen for Vega 56/64 where such rumored HBM2 costs would make those cards unprofitable and losses. But the conditions are vastly different today where HBM2 prices should have fallen significantly. Volta, Intel(mobile Vega), Vega 56/64 should have ramped up production significantly compared to the infancy of HBM2. More importantly there is two suppliers now that produce HBM2, that being Hynix and Samsung. All these factors should have lead to decreased pricing on HBM2 particularly with declines in the market recently of products with HBM2. Right now, there should be an oversupply of HBM2 with the demand of data center chips tailing off, Vega 64/56 dropping. I have a hard time believing the cost of HBM2 and interposers have some how skyrocked. Gamersnexus had Vega 64/56 interposer being 25 dollars and Fudzilla pricing for the interposer is 100 dollars which sounds like crock for a smaller interposer(Vega VII is a smaller chip). AMD is a smart company and I don't think they would nipped HBM2 altogether if it cost $420 for 16gb of HBM2/interposer with no chip. Particularly when the assembly of the HBM2 along with the chip onto the interposer step adds additional risk step which produces the bad dies seen given away to the press with the Fury X launch and Vega 64 liquid launch(the dies not attached to a PCB and look like a key chain). I think the price of HBM2/interposer are being over stated at this point to make the pricing of Vega VII look good. Because when Vega VII was launched at $699 people, particularly AMD fans were not happy with the price. Now with these rumors pricing taking over the conversation, now AMD looks good and are now being generous to consumers lol and we are willing to accept we are not getting a RTX 2070 + 5% for 250 dollars. But rather an RTX 2070 + 10% for $699 which Nvidia already offered lol. AMD should be given credit for helping consumers if AMD really released $250 RTX 2070 beaters, but not $699 RTX 2080s. They should be lambasted just as much. How AMD manipulate the rumor mill is nothing short of genius. NVIDIA GeForce Event For Next-Gen GeForce 11/20 Series Announcement Confirmed For August 20.